Lifestyle Pro is an awesome online magazine-style WordPress theme from StudioPress developer club. It has been well organized and designed for all kind of content-based websites like news, magazine, fashion industry, health care, fitness, cooking based or any bloggers to use on their daily updates. Lifestyle Pro Theme is a responsive design that supports all smartphone and tablet PC devices. Since Lifestyle Pro has been powered with Genesis Framework, you will have plenty of features like custom colors, fonts, layouts, SEO optimized coding, HTML5 and much more. 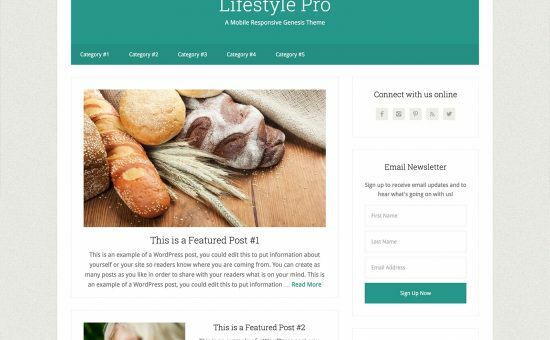 Lifestyle Pro WordPress theme comes with 10 preset colors, 6 custom layout options, custom background support, custom designed header options, featured images for individual posts/pages, drag-n-drop widgets and threaded comments for users.